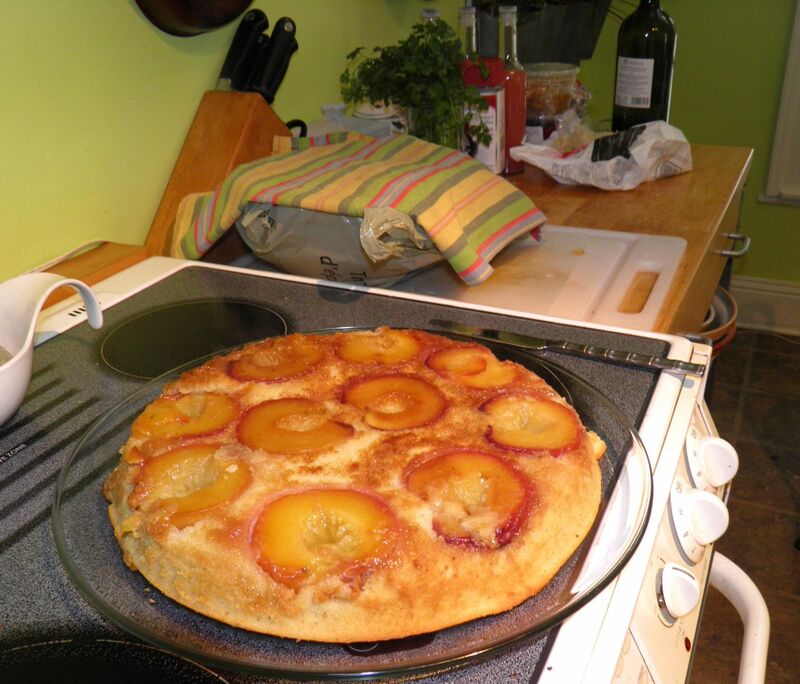 One very large upside down cake. Can't wait until after dinner. Today is a snow day in Nova Scotia, for sure. We’re about half way through a nor’easter. It seems to be a bit of a fizzle. I’m in Halifax, Nova Scotia. I understand that it’s far worse in Shelburne and Liverpool, NS where high tide storm surge has done some real damage. My thoughts go out to them. We’re in blizzard conditions here. That means blowing snow, not necessarily falling snow. I look out my window and I’m glad I’m inside, but I’ve seen worse. A lot worse. This “snow-mageddon” reminds me of storms when I was young. You know – regular storms. But I’m trapped. The local weather mavens – Cindy Day plus others – has the bejesus scared out of everyone, so stores are closed and we’re in lock down. So what do you do? If the power’s on you bake. Why not? There may as well be some pleasure from a difficult situation. Cake is the answer to may of life’s more difficult problems. I just got back in from shovelling the front sidewalk and walking the dog. Someone was happy to be out. It wasn’t me. As soon as we were in I got right at my baking to try to be done before any power outages. This wonderful, country recipe is loosely based on a recipe I found online. I say “loosely” because I’ve changed almost everything from the original. That’s not necessarily a bad thing. I wanted something sweet to eat but didn’t want to put a lot of work into it. I knew I would be shovelling later. I put every shortcut I could think of into this one. There is no creaming of butter and sugar. It’s mix together and into a frying pan it goes. That way there’s only two pots to dirty. If you’re ever in a fix for an easy dessert that looks and tastes great when finished, give this a try. There’s nothing like something upside down from a frying pan to scream haute cuisine! So get out the pan and make a dessert worthy of several generations of grandmothers. “Fine dining” doesn’t always mean complicated. 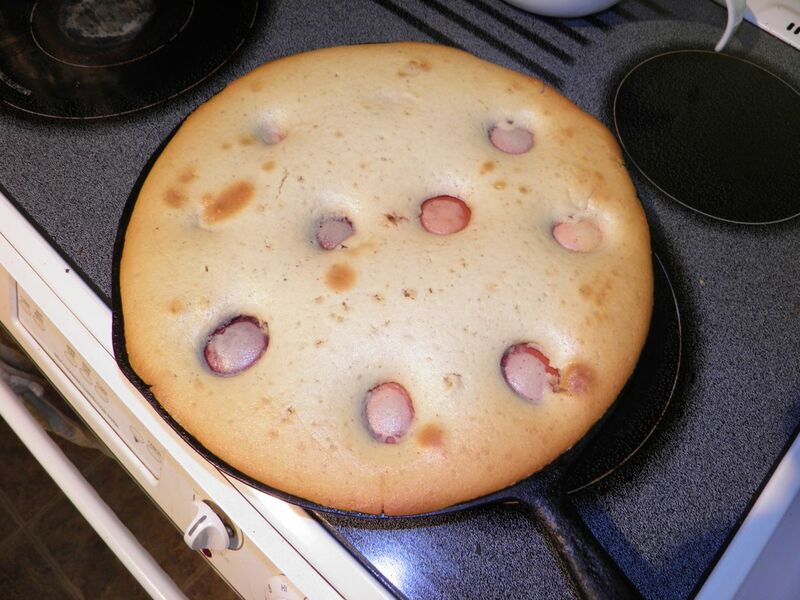 You need a fairly wide skillet for this one. Cast iron is best. The skillet I used is 12” wide x 1-1/2” high. Smaller will change baking time slightly, and the sides will need to be taller. Cut the peaches in half and discard the pits. Melt the butter in an oven proof skillet. Add the sugar and stir to mix. 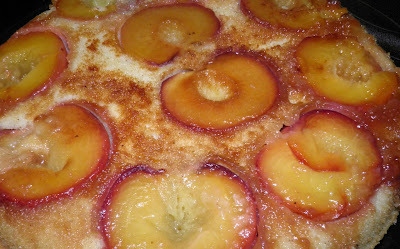 Place the peach halves cut side down in the pan. Cook until the cut surfaces caramelize and turns slightly brown. Remove the pan from the heat. Melt the butter in a medium sized bowl over low heat. Add the sugar and whisk well.Then whisk in the eggs, one at a time, until the batter is thick and smooth. Stir in the milk, baking powder, salt and allspice. Then add the flour, 1/2 cup at a time. Then stir in the vanilla. 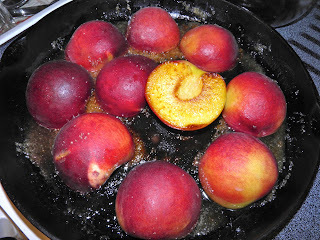 Pour the batter over the peaches (in the pan cut side down). Make sure the batter goes up over the halves. Bake for 35-45 minutes. The cake is done when a toothpick inserted in several paces comes out clean. Let rest for 10 minutes. Then loosen the cake and flip out into a plate. Serve with sweetened whipped cream or dusted with cinnamon sugar.